Multi-centric giant cell tumor (MCGCT) is a rare benign disease presenting as polyostotic osteolytic lesions in approximately 1% cases of giant tumors. 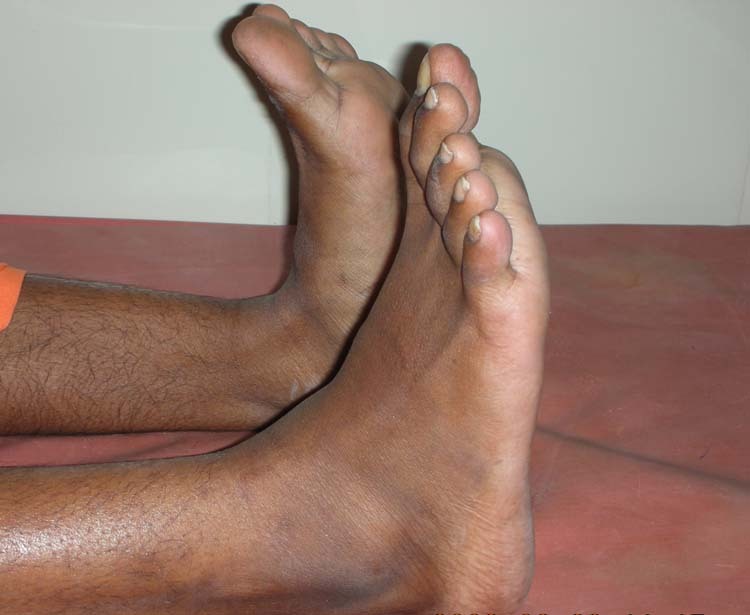 It presents as multiple lytic lesions that span the metaphyseal-epiphyseal region of short bones of hands and feet. 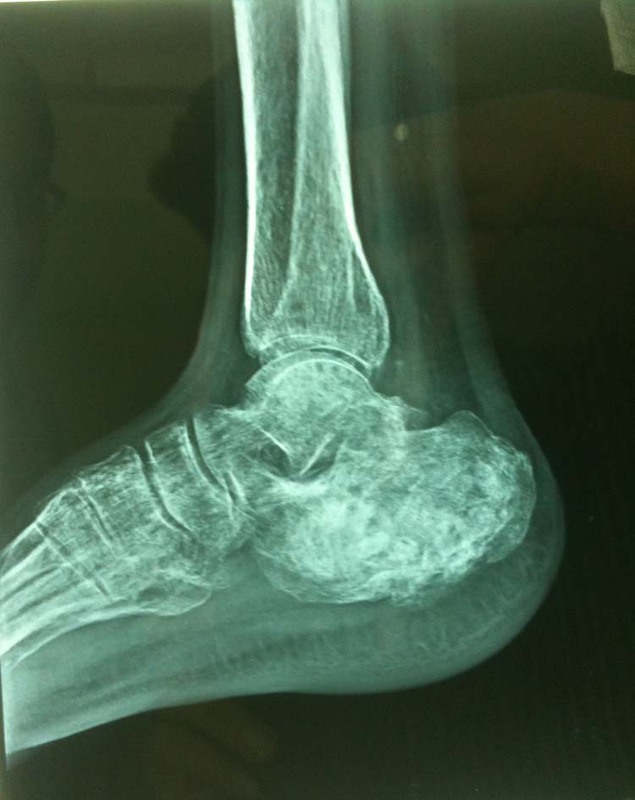 Although MCGCT has been reported at various sites, involvement of distal fibula has never been reported earlier. 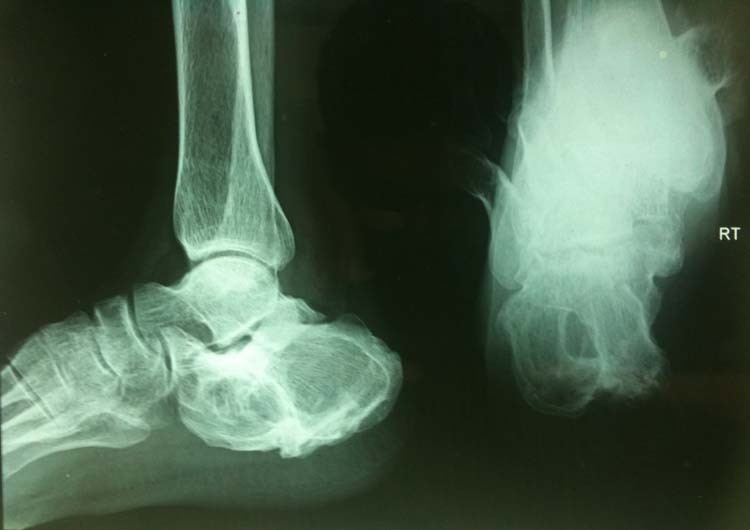 We present a case of MCGCT involving distal fibula and talus. It presented as swelling and pain in the ankle for four months. Initially on clinical and radiologic basis, it was diagnosed as osteoarticular tuberculosis and treated with Anti-tubercular drugs, without any relief. Diagnosis of MCGCT was made with open biopsy. Complete curettage of tumor from both sites and bone grafting was done. Patient has been symptom free at one-year follow-up. In India, osteoarticular tuberculosis presents as a common diagnostic dilemma. 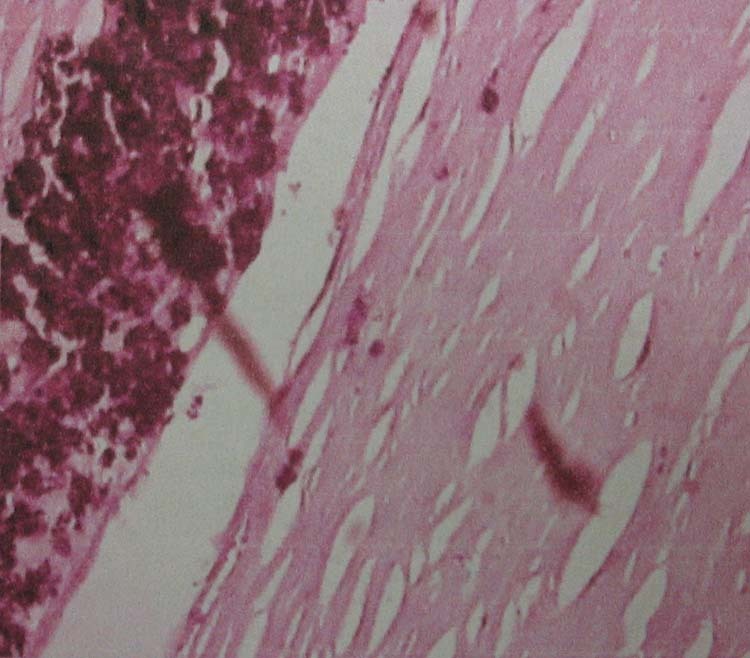 Biopsy and histopathological confirmation is necessary for definitive management. Key words: Multicentric Giant Cell Tumor (MCGCT), Open biopsy, Curettage, Bone grafting. Giant cell tumor (GCT) of bone is a benign aggressive tumor with features of frequent local recurrences and potential for metastasis and malignant transformation . GCT is commonly seen in young adults 20-40 years of age with slight female predominance, and constitutes 5% of total primary neoplasms . Giant cell tumor of bone typically presents as a solitary lytic lesion that spans the metaphyseal-epiphyseal region of long bones of adults. 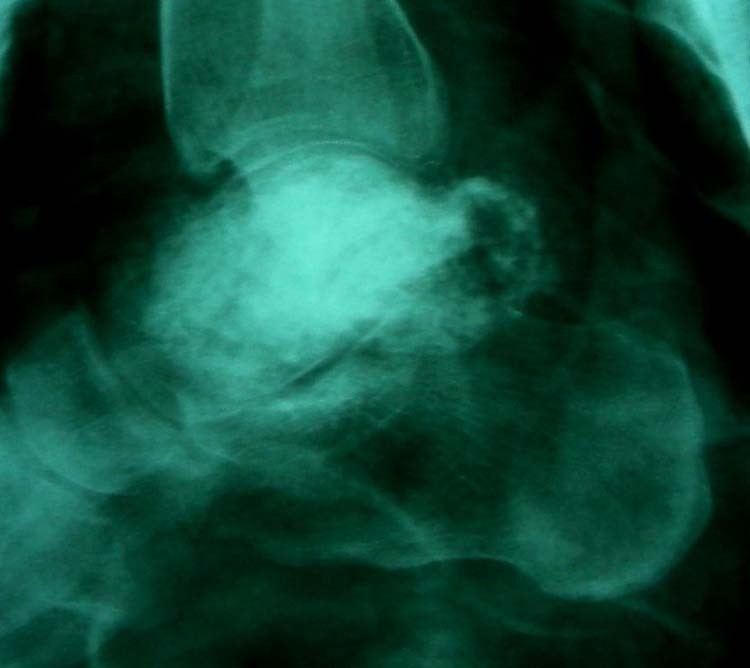 In approximately 1% of cases, however, it manifests as multiple synchronous or metachronous lesions in single or multiple bones. Such cases have been designated multicentric giant cell tumors and their pathogenesis is unknown. 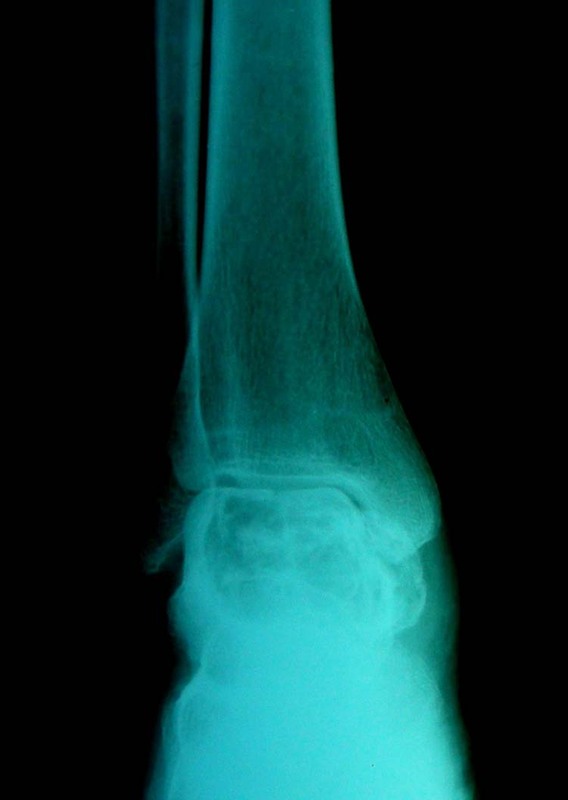 Their clinical and radiographic differential diagnosis usually includes a variety of polyostotic skeletal lesions such as Brown tumor, Paget’s disease, osteomyelitis, Non-ossifying fibroma, enchondromatosis, fibrous dysplasia, giant cell reparative granuloma, Langerhans cell histiocytosis, vascular tumor, osteosarcoma, hematopoietic malignant tumor, and metastasis. Although it is not common worldwide but in developing countries like India, osteoarticular tuberculosis is considered as differential diagnosis of lytic bony lesions . 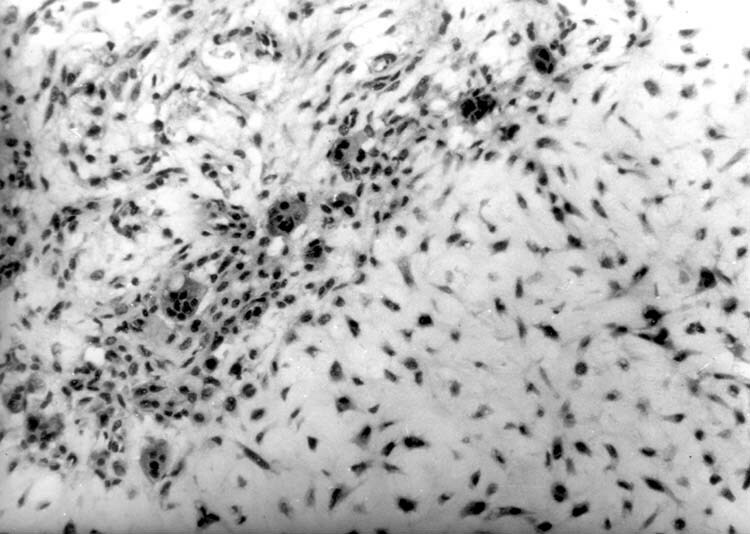 In most situations, a definitive diagnosis requires biopsy with histopathologic confirmation. To our knowledge, around 100 cases of multicentric giant cell tumor have been reported in the literature, and most of these have been small case reports [4-35]. Most of the series and case reports have reported occurrence of MCGCT in the hand and foot. 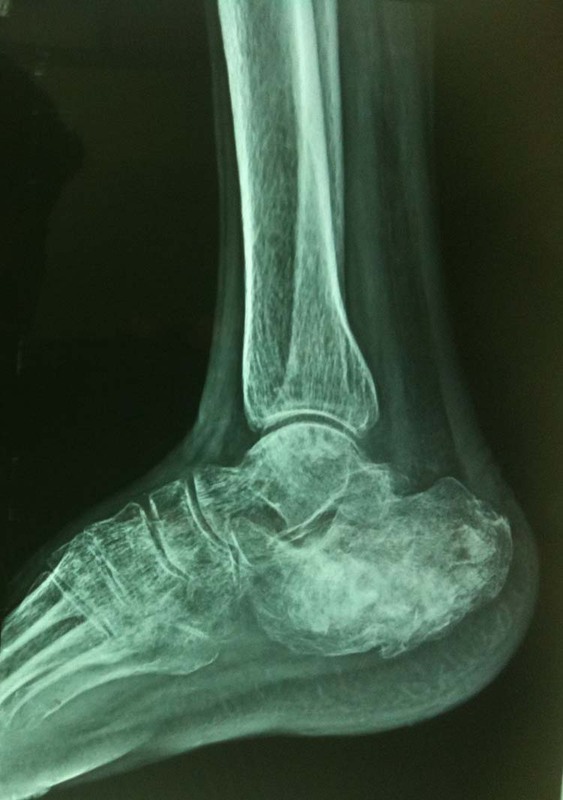 Though synchronous lesions in the foot have been reported in distal tibia, calcaneus, navicular, talus and even metatarsals, we found no case of MCGCT involving the distal fibula in the literature. We present one such case of synchronous MCGCT involving the distal fibula and talus on the same extremity for its rarity. This case becomes more so important to report because lesions like this can initially be confused with tuberculosis, especially in Indian scenario. 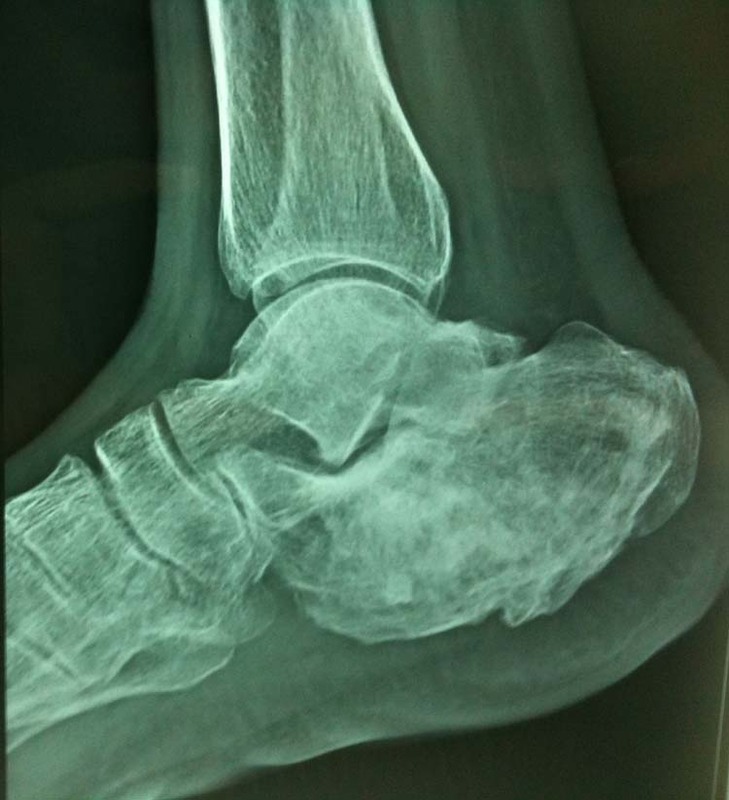 A 32 year old female presented with complaints of gradually increasing painful swelling of the left ankle for four months. Patient was on anti-tubercular drugs for six weeks without any relief. On examination there was diffuse tender swelling of 2cm x 1.5cm on the anteromedial ankle and 1cm x 1.5cm on posterolateral aspect of the left ankle. The temperature over the swelling was not raised. There was no sinus tract. ESR was 40mm/hr and TLC 11,000/cumm. 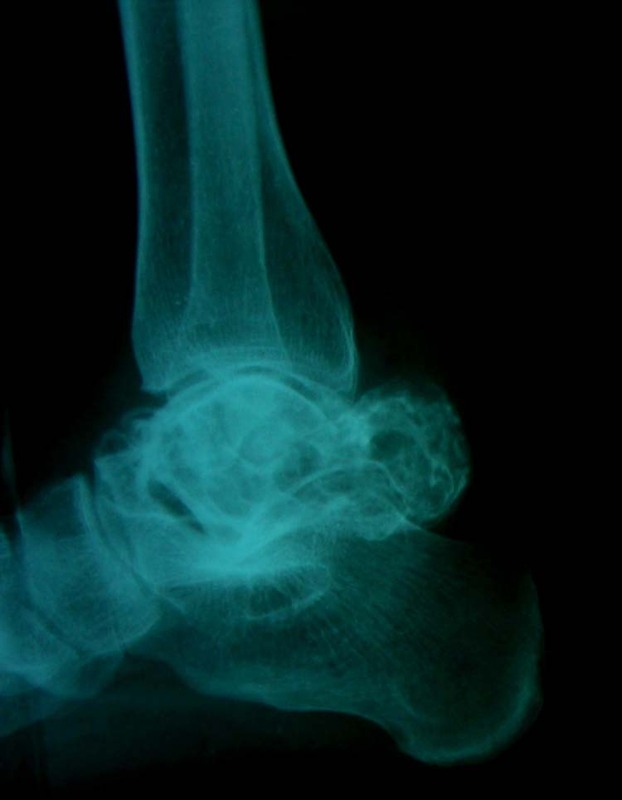 Radiographs and MRI of the left ankle were showed lytic lesions in the neck and body of talus and distal end of fibula (Figures 1 and 2). Open biopsy was done from the distal end of the fibula. Histopathological examination suggested presence of giant cells (Figure 3). 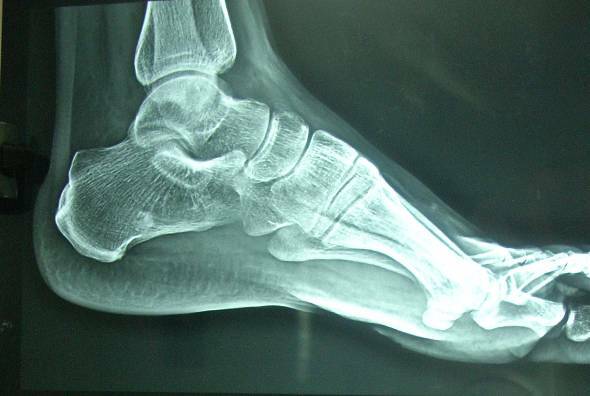 Curettage of the neck and body of the talus and distal fibula along with bone grafting was performed. The material from distal fibula and talus were marked separately and sent for histopathology which confirmed GCT at the two sites. A below knee splint was applied. Patient was kept non-weight-bearing for 6 weeks. There were no signs of recurrence at one year follow up. Primary multicentric giant cell tumors are rare and should be a diagnosis of exclusion [22,25,28,31,32]. MCGCT is more common in the short bones of hands and feet as compared to solitary GCT which tends to mainly involve the knee region and distal radius. GCT is capable of extending along fascial planes and directly crossing the joint space to a neighboring bone [5,14]. Controversy regarding pathogenesis of MCGCT exists to date. Mechanisms described include contiguous spread, iatrogenic seeding of tumor cells, benign metastasis, malignant transformation and de-novo multifocal formation [22,25,32]. Figure 1 A and B Left foot radiograph antero-posterior and lateral views showing lytic areas in body of Talus and Distal end Fibula. 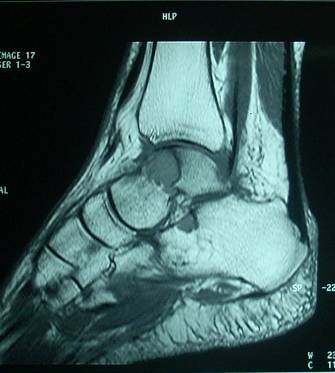 Figure 2 A, B and C MRI left foot showing lytic areas in body of Talus and distal end Fibula. Synchronous tumors are lesions arising from different locations and are discovered at different times within a short time period or simultaneously [20,28,32,43]. Metachronous tumors are discovered at different times and at different places [26,31,44]. The question of whether multifocal GCT is synchronous, metachronous, or metastatic lesion is difficult to answer . It is difficult to state definite criteria for distinguishing multifocal lesions from metastatic involvement, especially when second lesions are discovered later. MCGCT tends to involve the younger population with mean age reported between 20-24 years. MCGCT have been reported in a 10 year old as well as a 62 year old [3,25,32]. 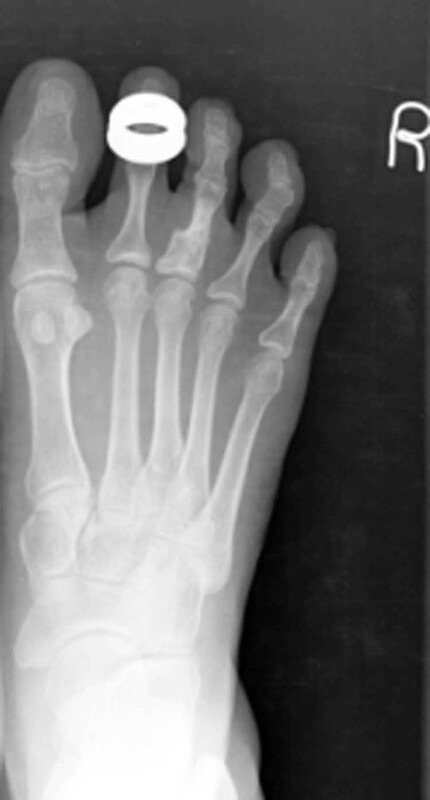 MCGCT of the foot is rare [20,25,36]. 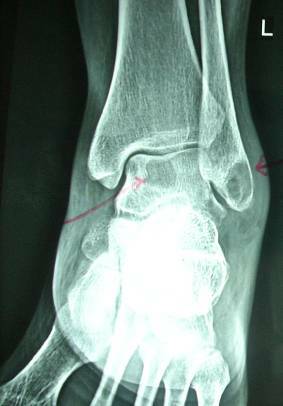 MCGCT has been known to involve the calcaneus, talus, navicular, cuneiform, proximal fibula but involvement of distal fibula has never been previously reported. Figure 3 A and B H&E slides depicting Giant cells marked with yellow arrows. Before a diagnosis of multicentric giant-cell tumor can be made, it is necessary to rule out the presence of hyperparathyroidism, which can produce features of a polyostotic osteolytic lesion that are virtually identical to those of a giant-cell tumor of bone. Fibrosarcoma of bone is usually a solitary lesion, but in certain rare cases multiple independent tumors develop simultaneously throughout the skeleton . Rarely, osteoblastoma may present as a multicentric lesion [40,41]. 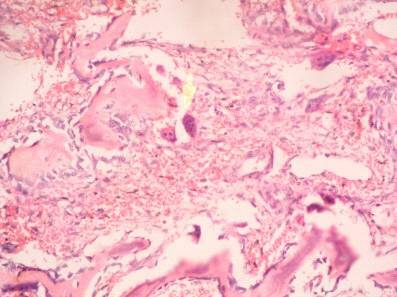 In India, osteoarticular tuberculosis presents as a common diagnostic dilemma. Biopsy and histopathological confirmation is necessary for definitive management. 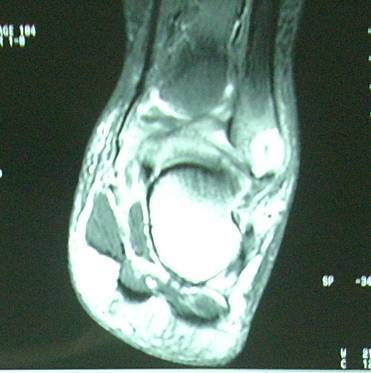 It has been reported that recurrence of giant-cell tumor of bone of the solitary type may be expected in 30 to 60 percent of cases; the rate depends on the type of treatment, the anatomical location, and the cortical integrity of the involved bone. Recurrence will usually be found within two years of the initial treatment. Cases have been reported with interval between first and last lesion varying from four months to 16 years . However, in one year follow-up, there are no signs of recurrence in our patient. 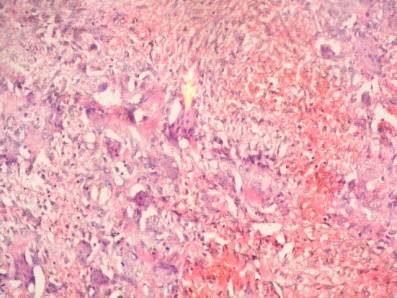 Dahlin DC, Unni KK; Giant cell tumour (Osteoclastoma). 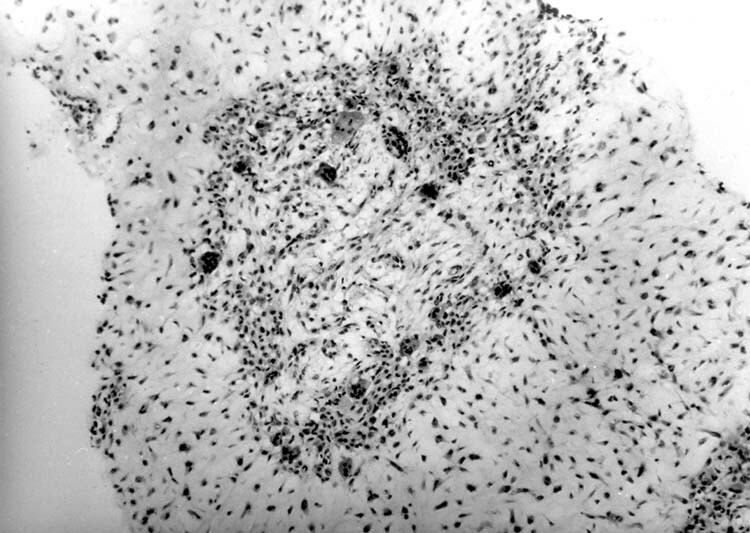 In Charles C Thomas, Bone tumours, 4th ,Illinois; Springfield, 1986; 119-40. Mercer SW. Mercer’s Orthopaedic Surgery, 9Ed. CRC Press. (1996) ISBN:0340551631. Campanacci M, Giunti A, Olmi R. Giant-cell tumours of bone. A study of 209 cases with long-term following in 130. Ital J Orthop Traumatol. 1975; 1:249 -77. Coley BL, Higinbotham NL. 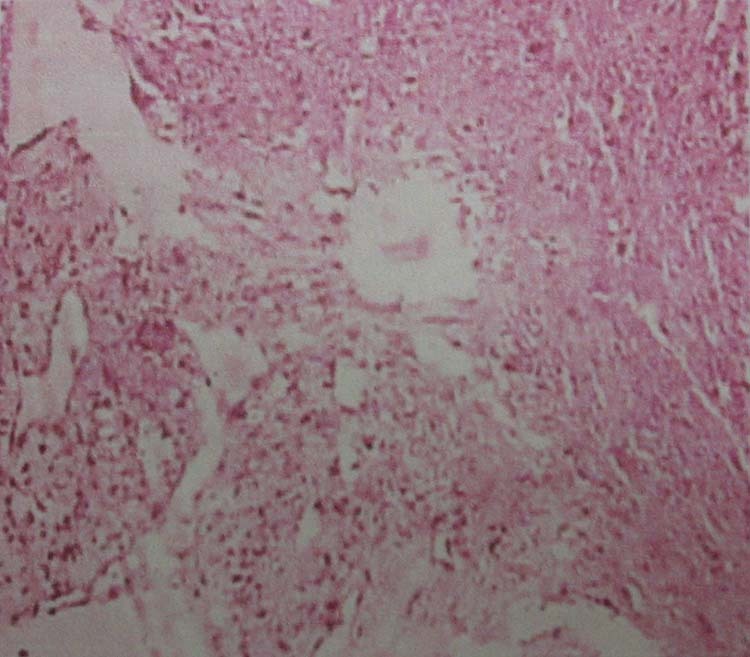 Giant cell tumor of bone. J Bone Joint Surg Am. 1938; 20 (4):870 -84. McInerney DP, Middlemiss JH. Giant cell tumor of bone. Skeletal Radiol. 1978; 2:195 -204. Schajowicz F. Giant-cell tumors of bone (osteoclastoma). A pathological and histochemical study. J Bone Joint Surg 1961;43 (1):1-6. Unni KK Dahlin’s Bone Tumors. 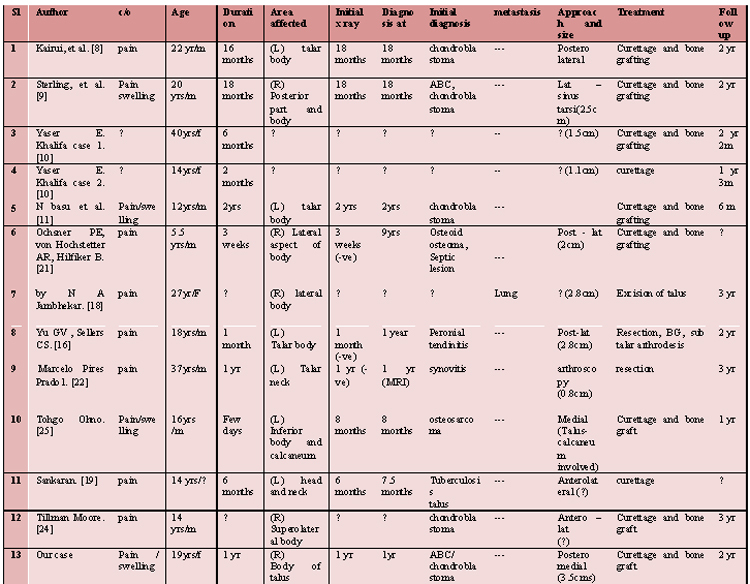 General Aspects and Data on 11,087 Cases. Ed. 5, p. 263. Philadelphia, Lippincott-Raven, 1996.
Cooper AS, Travers B. Surgical Essays. 3, pp. 178-179. London, Cox, Longman, 1818.